Address: Avenida del Golf, s/n, Costa Teguise (Lanzarote), Islas Canarias. 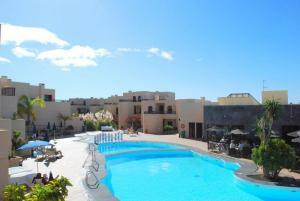 This complex is situated in a quiet area of Costa Teguise, 500 metres from the nearest beach. Featuring tennis courts and 2 swimming pools, it offers well-equipped apartments with private balconies. Each apartment at Apartamentos Blue Sea Costa Teguise Gardens has a kitchenette with a microwave and fridge. All have a ceiling fan and a fully-equipped bathroom. Satellite TV is available for a surcharge. The Blue Sea’s buffet restaurant serves a range of international cuisine. The Rodeo Bar offers a range of cocktails with live entertainment, whilst the pool-side bar serves drinks and snacks. Air conditioning is available in common areas. Staff at the tour desk can arrange bicycle and car rental, as well as provide information on the surrounding area. Local activities include watersports and volleyball. The Blue Sea is less than 3 km from Costa Teguise Golf Course. Guests are required to show a photo identification and credit card upon check-in. Please note that all Special Requests are subject to availability and additional charges may apply. When booking more than 6 rooms, different policies and additional supplements may apply. Satellite TV is available for a surcharge. A free shuttle bus service to Cucharas Beach is available for all-inclusive guests.